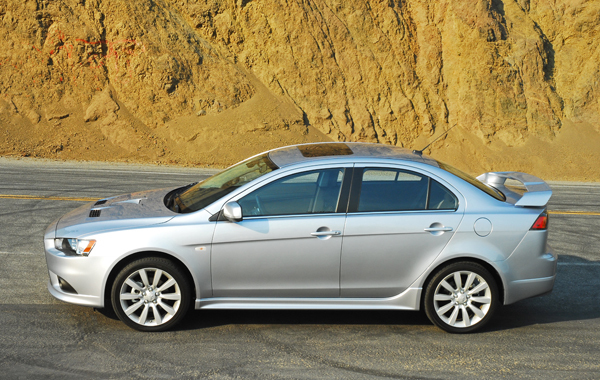 The all-new 2009 Mitsubishi Lancer Ralliart is a great mid-level performance sport sedan that delivers enthusiasts great styling, plenty of power and performance, seating in an interior boasting sporty styling cues plenty of safety features, all for a base price of just $26,490.00. The all-new Ralliart is based on the Lancer GTS platform; adopting powertrain and 4-wheel drive technology from the awesome Lancer Evolution MR. The result is a unique model optimized for exhilarating yet balanced overall road performance. TheLancer Ralliart gets a modified version of the Lancer Evolution 4B11 T/C turbocharged and intercooled 2.0 liter DOHC MIVEC 4-cylinder engine, teamed up with the twin-clutch-Sportronic shift transmission (TC-SST) from the Evolution MR model. 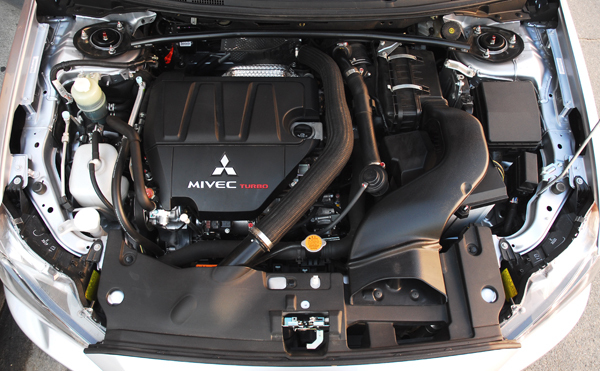 Starting with a Lancer Evolution long block assembly, the turbocharger, intercooler and valve timing are modified for very impressive street-oriented performance. The engine produces 237hp at 6,000rpm and 253lb.ft. of torque at 3,000rpm. Shifting is fast and easy using the manual shifter on the console, or the Sportronic steering column-mounted magnesium-alloy paddle shifters, or you can keep it in D and let the car shift automatically. 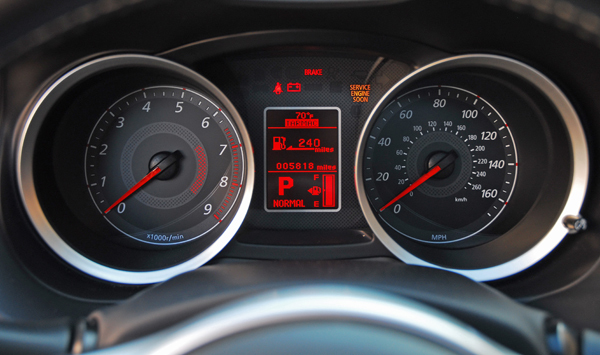 The Lancer Ralliart’s TC-SST unit features Normal and Sport shifting modes depending on how you want the car to react to your inputs, and a higher 5th and 6th gear ratio that help enhance fuel economy. In 1st or 2nd gear with the transmission set on Sport mode, you will be quickly pushed into your seat as the turbo kicks in at just 2,100rpm, rocketing you out to 60mph from a standstill in just 5.6sec. while covering the 1/4mi. in 14.6sec. at 94.8mph. The foundation for the Ralliart’s agile handling is the rigid and torsionial, performance-engineered, global platform that also underpins the Mitsubishi Outlander SUV. 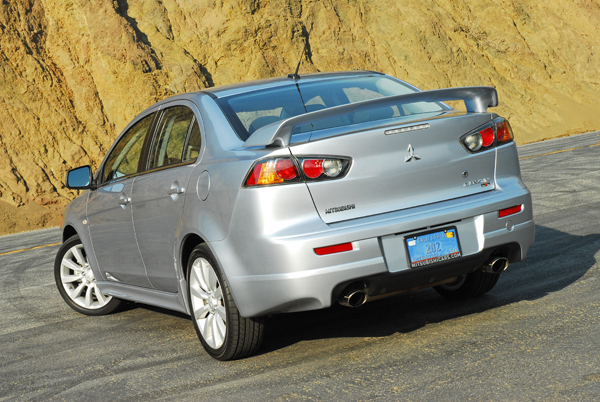 The Lancer Ralliart’s All-Wheel-Control (AWC) system is based on a competition-derived, computer-controlled Active Center Differential (ACD) unit that distributes torque between the front and rear wheels in response to the current driving conditions. You can set system response parameters using a ‘Tarmac, Gravel, or Snow’ selector. A helical limited-slip front differential, and a mechanical limited-slip rear differential, help optimize side-to-side torque distribution. For excellent road-holding ability is an excellent fully independent, sport-tuned suspension featuring MacPherson struts, a strut tower brace, higher spring and damper rates and a thick anti-roll bar. The multi-link rear features specific trailing arms, coil springs, gas-charged shocks and an anti-roll bar that keeps the rear in line with the front. Enhancing both traction and grip of the four-wheel-drive system are the large, 18X8in. cast alloy wheels wrapped with sticky 215/45R18in. Yokahama ADVAN summer tires. Keeping you from getting in trouble are the standard active stability control system and traction control. The power-assisted rack & pinion steering system enables fast reaction to your inputs and gives you the confidence to push to the limit with a well-connected feeling. Safely slowing you down from speed are power-assisted 4-wheel disc brakes. Up front are 11.6in. vented rotors clamped with big, dual-piston calipers, while 11.in. solid rotors are clamped with larger diameter, single-piston calipers. ABS helps you maintain control when braking on slippery or slick pavement. 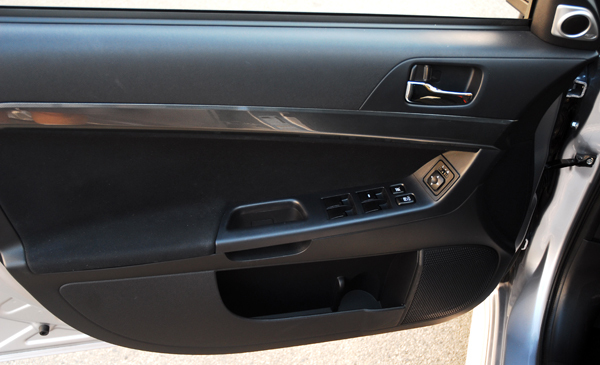 The brake pedal gives a very good linear feel as you press you foot down you can feel the binders grabbing hold. 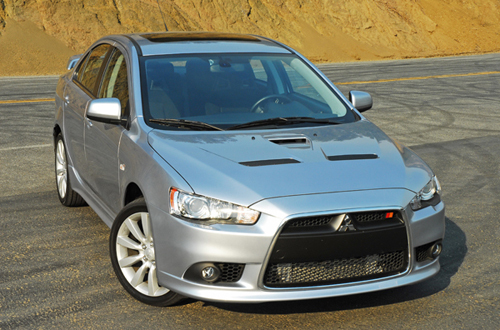 Showing a clear kinship to the Lancer Evolution MR, the Ralliart sports its own aggressively styled front bumper with a wide-mouth, trapezoidal opening surrounded by an aluminum strip, cat-eye headlamp clusters, and integrated foglamps in the lower bumper. The aggressive rear bumper features wraparound lamp clusters, dual exhaust outlets, a modified diffuser, and a high-mounted spoiler to help increase rear downforce. 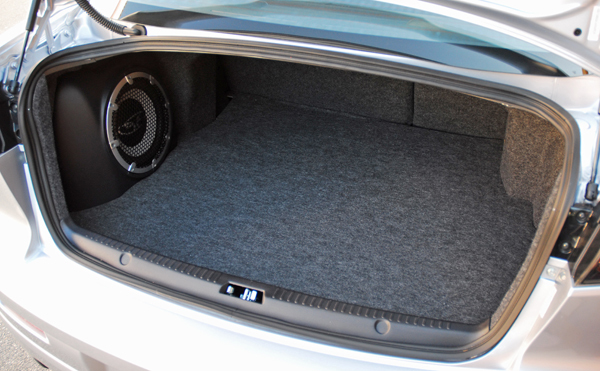 The lightweight aluminum, ducted hood delivers cooling air to the turbocharger and vents engine heat. 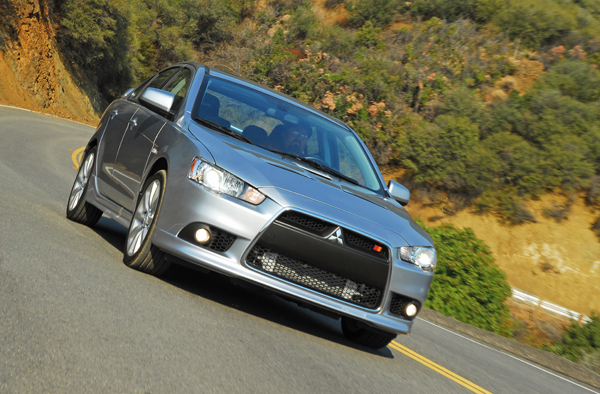 From the side you see a steeply raked windshield, a nice crease running up below the beltline, aero-styled side-view mirrors, and deep side extensions to further give the Ralliart a more aggressive stance and lower its center of gravity to increase cornering ability. 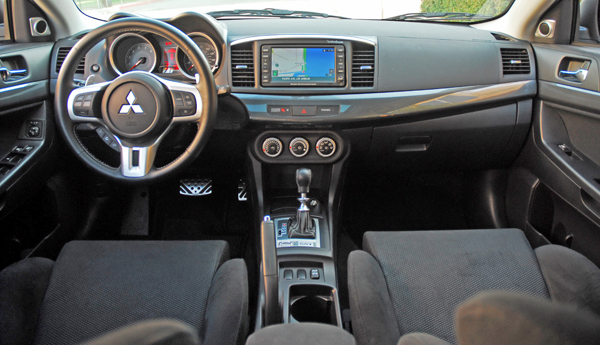 The Ralliart interior shares much of its design and content with the Evolution MR. These styling cues include the sporty, tilting, leather-wrapped steering wheel with audio and cruise-control switches, a leather wrapped stick shifter with a baseball top and billet aluminum stork, aluminum faced foot pedals. 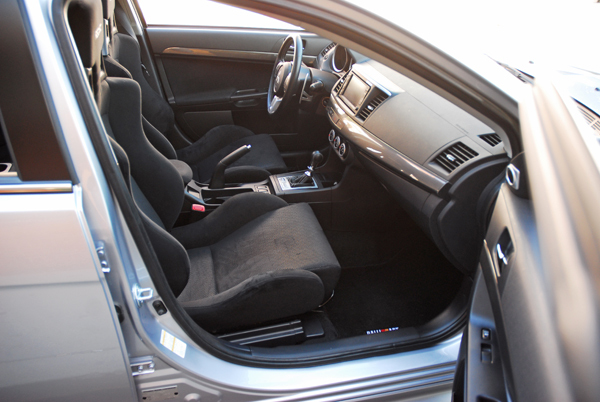 It would have liked to have seen the steering wheel featuring a telescopic setting so that I could have moved the steering wheel closer to me and let my legs stretch out like in other high-performance sport sedans. The instrument cluster is easy to see and all buttons, switches and dials are within easy reach and illuminated for safe nighttime travel. 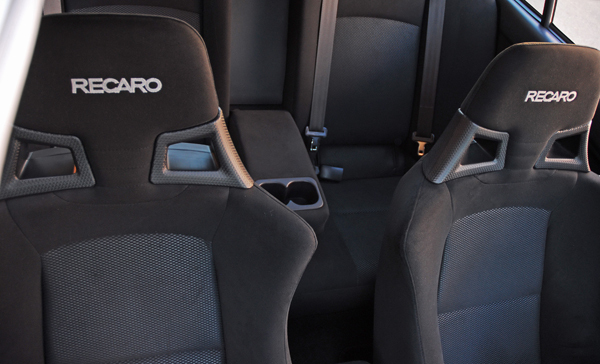 Like the Lancer Evolution, the Ralliart can be equipped with RECARO sport bucket seats that really add extra comfort and extra side bolstering, a real plus. Standard features include a FAST Key hands-free entry system, a Bluetooth HFP system with voice recognition for hands-free calling, automatic climate control, a 140-watt AM-FM-CD audio system with digital signal processing, MP3 playback capability and six speakers, 60/40 split folding high-back rear seat with a pull-down center armrest and dual cupholders, trunk and fuel filler door inside releases, grab handles above each door, anti-theft engine immobilizer and security system, center floor console box with armrest, chrome lower side door molding, floor mats, front map lamps, power door locks and side-view mirrors, and power windows with driver-side one-touch up/down. Options include a 650-watt Rockford-Fosgate premium audio system with PUNCH control and 9-speakers including a trunk-mounted subwoofer, HID headlamps, 6-CD/MP3 in-dash changer, and SIRUIS satellite radio with 6-month subscription. The all-new 2009 Lancer Ralliart has really grown more powerful and performance driven, and a very good economical alternative to the higher-performing, yet more expensive Lancer Evolution MR.
Standard safety features include an advanced dual front airbag supplemental system, with occupant sensors, standard front seat-mounted side-impact airbags, side-curtain airbags, a driver’s knee airbags, three-point safety belts for all seating positions with front load-limiters and pretensioners, front and rear crumple zones and steel beams in each door. Front Leg Room: 42.2 in. 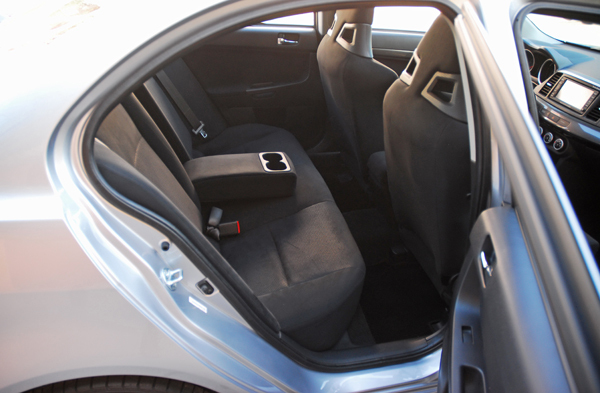 Rear Leg Room: 36.1 in. Luggage Capacity: 10 cu. ft. Acceleration (0-60 mph): 5.5 sec. Braking Distance (60-0 mph): 128 ft.
Automatic: 246.5 mi. / 362.5 mi.